In 2011, Ed Gillespie, then the chairman of the Republican National Committee approached Louisiana Attorney General Buddy Caldwell and asked him to switch from Democrat to Republican. Gillespie told Caldwell that their research indicated that he was one of the most conservative Attorneys General in the United States — far more conservative than the average Attorney General — and that he would be more at home in the Republican Party. Caldwell thought it over and agreed to switch. Since then, he has not disappointed conservatives. In fact, it would be fair to say there is no more conservative attorney general in the United States. Most of us complain about the overreach of the federal government under President Obama, but Buddy Caldwell is one of the few leaders in America who has stood up to Obama and been successful in stopping him. Altogether, Caldwell has sued the Obama administration nine times. Caldwell filed suit against Obamacare and carried that suit all the way to the U.S. Supreme Court. 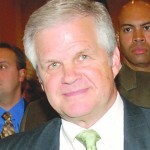 Caldwell defended Louisiana’s law prohibiting gay marriage and won the only legal victory in the United States on that issue, prevailing in federal district court. He carried that battle to the Supreme Court as well. In a landmark case, Caldwell filed suit to enjoin Obama’s executive order providing amnesty to more than 5 million illegal aliens. Caldwell won that injunction, and the 5th Circuit Court of Appeal upheld it. Today, thanks to Buddy Caldwell and the attorney general in Texas, Obama’s illegal amnesty plan has not gone into effect. Buddy Caldwell opposed a host of illegal Environment Protection Agency regulations that threatened Louisiana jobs, and the EPA backed down and withdrew them. When Obama issued a moratorium on drilling in the Gulf of Mexico, which was costing Louisiana workers and businesses millions of dollars a day, Caldwell intervened and got the moratorium lifted. When ACORN, the far left community organizing group, which Obama had worked with, was at its height, Caldwell learned of massive theft and wrongdoing in the organization. He moved quickly against its national headquarters, seized its computers and other equipment, and put them out of business nationwide permanently, which is why we never hear about ACORN anymore. When the federal Census included illegal aliens in the count and used the large number of illegals in California, Texas, and Florida to give those states additional seats in Congress, it resulted in Louisiana losing a seat. Caldwell filed suit to block that action. When the federal Bureau of Alcohol, Tobacco & Firearms proposed to ban ammunition for AK-47 rifles, Caldwell fought the ban, and the ATF backed down and withdrew it. When the City of San Francisco passed an ordinance to require that guns be locked at all times in a lock box, the federal district court upheld the ban. So Buddy Caldwell and some other AG’s intervened in the suit to have the ordinance struck down. Caldwell sued 114 major pharmaceutical firms for overcharging the Louisiana Medicaid program. Companies were charging the state outrageous sums. For example, one company regularly charged the state $70 for the same drug consumers pay $2.50 for at the drug store. In the end, Caldwell won, and the drug companies paid the State of Louisiana $299 million. In perhaps the most famous case, Buddy Caldwell sued the BP oil company over the Deepwater Horizon oil spill and won for the state $6.8 billion, or $10 billion overall — the largest settlement of a environmental disaster in the nation’s history. The attorneys for the state received $29 million — about 1/2 of 1 percent of the settlement — and the state’s attorney fees were paid by BP — not the taxpayer. After the first of the year, another important suit by Buddy Caldwell will be going to trial. He has sued State Farm for its alleged predatory practices of requiring auto repair shops to use aftermarket parts to repair insured vehicles, instead of manufacturers’ parts. Many believe that aftermarket parts can make vehicles unsafe and reduce their value. Some insurance companies are opposing Caldwell’s reelection, hoping that he and his suit will go away. During 42 years in the private practice of law — six years in private practice, 29 years as District Attorney, and seven years as Attorney General, Caldwell has amassed a remarkable record of success. He has empaneled more than 200 grand juries. In his major criminal trials, Caldwell has a 99 percent conviction rate, and has only lost two cases in his entire career. Caldwell is not only an outstanding prosecutor and civil trial attorney, he teaches attorneys all over the state. Unlike a Congressional office, which is primarily a political office, the Attorney General’s office is not a political office. Rather, it is a law office with 180 attorneys and more than 280 non-attorney personal. The AG’s office currently has more than 5,000 civil and criminal cases. It is essential that the Attorney General be an outstanding lawyer, who at the top of his profession. It is essential that the Attorney General, who is the State’s top attorney and chief prosecutor be an actual attorney, but not only that, it is essential that he be an outstanding attorney with a great deal of real-life experience. That leads us to Attorney General Buddy Caldwell’s chief opponent, former Congressman Jeff Landry. He served in Congress for two years. During that time, he had a solid conservative record. He did that political job well. However, he is completely unqualified professionally to be the Attorney General of Louisiana. When Mr. Landry asked the Republican Party of East Baton Rouge Parish for its endorsement, the party asked him to provide basic information about his experience as an attorney in order to document his professional experience. But Landry was unable to provide any documentation whatsoever. •His experience practicing civil law. •His experience practicing criminal law. •His experience in trying cases before a jury. •His experience in trying complex civil cases. •A listing of his appearances before the U.S. Supreme Court, the Louisiana Supreme Court, and the various courts of appeal. •Examples of his legal writing, such as law review articles, briefs, or other legal arguments which would demonstrate his ability to handle serious legal issues. •His experience in administering or managing a prosecutor’s office, a law firm, or a business organization. Mr. Landry was unable to provide any documentation or any explanation that he has done any of the above. Apparently, Jeff Landry has never tried a civil or criminal case, never tried a jury trial, never appeared before a court of appeal, and never tried complex civil litigation of any size, much less cases involving millions or billions of dollars. In his TV commercials, Mr. Lan-dry states that he worked for a “top law firm for 10 years,” but we have found no evidence of that. Mr. Landry reports that he graduated from Loyola Law School in 2004. When he ran for U.S. Congress in 2010, he filed financial reports showing no payments to him during 2009 from a “top law firm.” In 2010, he reported a salary from his own law firm of $12,000 but no income from a “top law firm” or any law firm and no payments from any legal clients. In 2011 and 2012, he reported no legal income of any kind. Then in 2015, when he qualified to run for Attorney General, he filed with the State of Louisiana a personal financial disclosure form for 2014 showing no income from his law firm, no payments from a “top law firm,” and no payments from legal clients. We have no doubt that he has been a member of the bar for the past 10 years, but as far as having been engaged in practice of law on a full-time basis for any significant period, we find no evidence of that. We have searched for evidence of reported cases handled by Mr. Landry and found none. We have searched for evidence of a law office and found none. •Buddy Caldwell is a liberal Democrat. •Caldwell endorsed gun-grabbing black Rep. Barbara Norton of Shreveport. •Caldwell has a corrupt “Buddy System” that awards legal contracts to his supporters. • Caldwell is a conservative Republican. As shown above, the Republican Party recruited him to become a Republican because he was one of the most conservative Attorneys General in the nation. Furthermore, there is absolutely nothing in his record as Attorney General that can be labeled as “liberal.” On the contrary, his record as Attorney General is solidly conservative. •Above all, Mr. Landry’s campaign appears to be based on the accusation that Buddy Caldwell supposedly endorsed Mary Landrieu for reelection to the U.S. Senate. The evidence Landry produces is a cell phone video of a private party during Mardi Gras in Washington, a time notorious for pranks and humor. Mr. Landry fails to produce a news release from Caldwell endorsing Landrieu, a radio or TV commercial, a mailing or anything else that shows this supposed “endorsement” going from Caldwell to any registered voter. Nor were their news stories reporting this alleged “endorsement.” Nor does Mr. Landry’ bother to mention the fact that David Vitter’s brother sang at the same Mardi Gras party right before Caldwell. There is an even bigger problem with Mr. Landry’s ridiculous and false charge: Since becoming Attorney General, Buddy Caldwell has had a policy not to endorse any candidate for any office, because he might have to rule on an election issue involving that candidate. • We have found no evidence whatsoever that Buddy Caldwell endorsed Barbara Norton, who represents a 70 percent black district and who had no Democrat or Republican opponent. Caldwell appeared at a campaign event, just he has appeared at hundreds of campaign events for public officials, black and white, Republican and Democrat, all over Louisiana. That’s where the votes are. Caldwell simply attended the event and shook hands, but he did not make an endorsement. •Federal Election Commission records show no contributions by Buddy Caldwell or his committee to Landrieu or Obama or any other political figure. •The accusation that Caldwell has a corrupt “Buddy System” for awarding legal contracts is perhaps the most ludicrous of all. There has been absolutely no showing of any quid pro quo in the awarding of legal contracts. As far as we have been able to determine, all attorneys who wish to be considered are put on a list at the Attorney General’s office, their qualifications are reviewed, and the best candidates are chosen. For example, in the BP case, the Attorney General’s office fought BP for more than four years to win a judgment for environment costs suffered by the people of the state. In the end, Caldwell, through the private attorneys he had hired, won a settlement with BP of $6.8 billion — the largest settlement of an environmental catastrophe in American history! BP hired some of the best attorneys in the United States to represent their interests. In the end, BP paid their attorneys more than $3 billion in legal fees. The outside counsel which represented the State of Louisiana were paid $29 million — 1/2 of one percent of the settlement amount, and about one percent as much as the BP attorneys were paid. Moreover, the taxpayers of Louisiana did not pay the outside counsel one penny. Rather, BP had to pay 100 percent of the cost of the state’s attorneys. All in all, it was a great deal for the taxpayers of this state — the largest judgment in history at no cost to the taxpayers! •Caldwell has done an outstanding job as Attorney General. •He is a solid conservative. •Mr. Landry’s accusations are false. •Mr. Landry is not qualified for the office of Attorney General. As a result, we recommend Mr. Caldwell for your consideration to be reelected as Attorney General. Four Major Candidates for Lt. Gov.